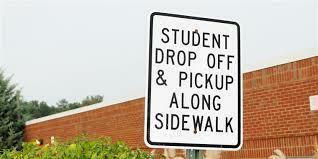 Morning Drop Off by Parents in Cars – Parents, please pull up to the stop sign on the west end of the drive. Please don’t get out of your car to drop off your students. If you need to help your child in and out of the car (seatbelt), please park in the parking lot, so as to not hold up traffic. You will need to walk your child across the traffic lane.